There’s a corner of my mind that is always thinking about eating jerk chicken. Hot from the jerk pan; smokey, spicy, sweet, juicy, crispy and nice. It’s next to the corner of my mind that houses sub-bass sound systems and good time vibes. Grilled chicken is the universal language of good food. If you can grill chicken then you’ve got good eats. Yakitori, tandoori, poulet roti, schwarma, gai yang; it’s the original streetfood. Jerk is the Caribbean way of doing it, heavy with the spices and flavours of those Islands. Smoked and grilled in converted oil drums called jerk pans over pimento branches to give it a heady aroma. 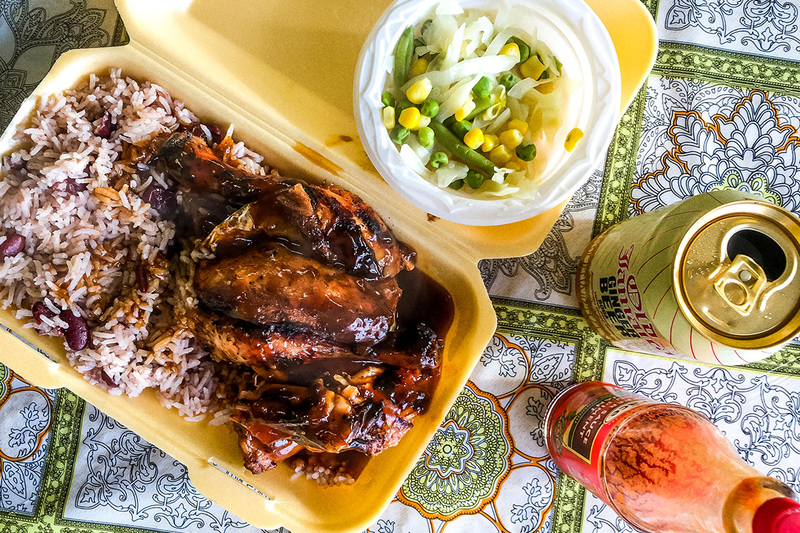 The perfect jerk chicken maybe the global king of all grilled chicken streetfood dishes. So Brum, where’s the good jerk at? In every neighbourhood there’s a Caribbean takeaway, but here’s the rub; jerk chicken is the hardest thing to get right. To do it properly someone has to light a jerk pan, stand over it, turn the meat and occasionally spray it with Red Stripe. Fine in the summer but who’s seriously doing it on a damp Friday in January? Let me tell you, not many. Even if you see a jerk pan outside the shop, it’s worth knowing what day they light it. You can be sure that if they can get away with lighting it once a week they will. Good jerk is fresh jerk, the rest of the week bad jerk is reheated jerk. Firstly, let’s clear the boards of the imitators. When is jerk not jerk? Well, in my book if it hasn’t been cooked in a jerk pan then I’m not really interested. It’s got to have that deep smokey flavour. Yes, Carib Grill in Moseley and Turtle Bay in the City Centre has some nice juicy chargrilled chicken but they both bake it then finish on a grill. Basically, the same as Nandos. I like Nandos but jerk is jerk. There are others, Russells in Lozells and Blue Marlin in Digbeth both chickens have no grilled or smoke flavour at all. It’s nice chicken, juicy but just drowned in sweet gravy so it tastes just like brown stew chicken. I doubt if any of it has seen the inside of a jerk pan. It’s easy to tell by looking, if there’s no pink tinge just below the skin then it hasn’t been jerked. It’s the same pink ring you get with American style BBQ. Let’s get to the contenders. From the roof terrace of The Church Inn in the Jewellery Quarter, you can sometimes smell the jerk pan from Portland Lagoon. On a late Wednesday afternoon however the jerk is a little tired, the texture a bit soft and wooley but the taste is good. I suspect it’s not as fresh as it could be. Ken’s Diner on Birchfield Road, Aston is a prime example of fresh is best. If you ask for jerk at the start of week Ken will say no way come back Friday or Saturday. So I come back at 1pm on a rainy Friday just when the chicken is being lifted off the grill. It couldn’t be fresher, two legs chopped sitting atop perfectly cooked rice and peas. A really generous portion. The chicken has a subtle spicing and sweet smokey flavour. I’ve had more flavourful jerk but I can appreciate the nicely cooked chicken. Ken’s is worth checking out if you ever find yourself driving out of the city along that main road. Chris’s Restaurant, hands down had the best jerk in this little roundup. But you know, it got me thinking about how random jerk can be in the winter. If you don’t know when to go to these places then you might as well stick to the curry goat. In summer, at festivals or at outdoor markets where you can see the jerk pans smoking there’s no doubt, just queue up and enjoy. I like Sharians or The Jerk Hut or any number of stalls at the Simmer Down Festival in Handsworth, where you have to roll me off the grass after I’ve eaten so much Caribbean food. Best of all is to cook it at home and with my recipe you can. Invite your friends and get them to bring the sides. You don’t need a jerk pan, any covered BBQ will do. At a push just roast it in an oven and finish it over hot coals. But you know it won’t be the same. And yes, Malibu! Once you’ve had it you won’t go back to ordinary jerk!